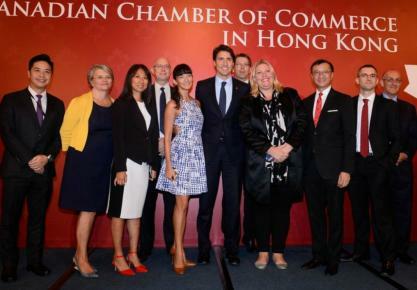 Last week, many of the roughly 300,000 Canadians in Hong Kong were delightedly filling social media feeds with updates on Canadian Prime Minister Justin Trudeau’s arrival in the SAR, with a fervour matching that of any major Hollywood celebrity’s visit. And why not; aside from his well-documented good looks and charisma, the ambitious young politician is already known for his determination in dragging Canadian parliament into the 21st century on themes like diversity, gender equality, and climate change. The Prime Minister kicked off his visit with a visit to the Sai Wan War Cemetery, in Chai Wan, where he honoured the 283 Canadian soldiers buried there, many of them unnamed, who lost their lives defending Hong Kong during World War II. 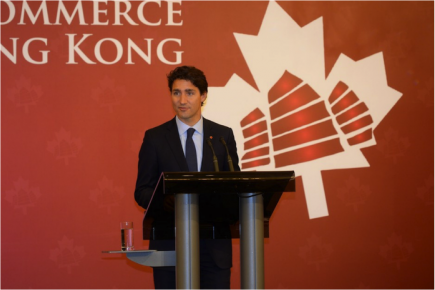 Later on, he took the stage at a luncheon held by the Canadian Chamber of Commerce in Hong Kong, in his sole public appearance during the short stay in the SAR. 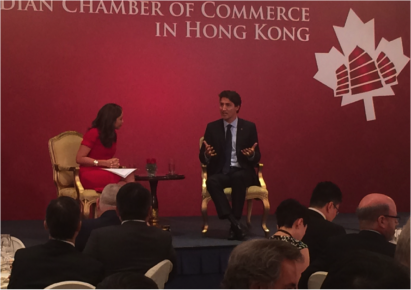 At the luncheon he gave a short keynote speech, followed by a candid fireside chat with Bloomberg anchor Angie Lau. Lau opened the interview with a “politically charged question that could cause division throughout the nation” – asking the PM about his favourite hockey team. After confirming it to be the Montreal Canadiens (with some light ribbing of the reporter for her own home team, the Toronto Maple Leafs), the interview turned to more serious topics. He also laid clear his intent to open up foreign investment in Canadian natural resources, saying, "Yes, we have to think about it in terms of ‘what are the benefits, what are the labour standards, what are the environmental impacts’… but I don't think that anyone can imagine that we would do better by closing ourselves off from the world." The visit, which also included meetings with Chief Executive CY Leung and high-profile business tycoon Li Ka-shing, marked the last stop in an 8-day trip centered around his attendance at the G20 summit in Hangzhou and diplomatic discussions in Beijing.